For the former president of Fudan University with the same name, see Li Denghui. Lee Teng-hui (Chinese: 李登輝, Mandarin pronunciation: [lì tə́ŋ.xu̯éi̯]; born 15 January 1923) is a Taiwanese statesman. He was the President of the Republic of China and Chairman of the Kuomintang (KMT) from 1988 to 2000. He was the first president of the Republic of China to be born in Taiwan. During his presidency, Lee advocated the Taiwanese localization movement and led an ambitious foreign policy to gain allies around the world. After leaving office Lee was expelled from the KMT for his role in founding the pro-independence Taiwan Solidarity Union (TSU), which forms part of the Pan-Green Coalition alongside Taiwan's Democratic Progressive Party. Lee is considered the "spiritual leader" of the TSU, and has recruited for the party in the past. Lee has been outspoken in support for Taiwanese Independence from China. At the age of 96 years, 98 days, he is the oldest living Taiwanese President and second longest living President of the Republic of China after Wellington Koo who lived to 97 years, 289 days. 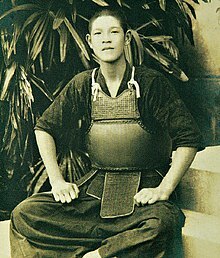 Lee Teng-hui, junior high school student days wearing kendo armor. Lee was born in the rural farming community of Sanshi Village, Taihoku Prefecture, Japanese Formosa. As a child, he often dreamed of traveling abroad, and became an avid stamp collector. Growing up under Japanese colonial rule, he developed a strong interest for Japan. His father was a middle-level Japanese police aide, and his brother joined police academy and soon volunteered as for the Imperial Japanese Navy and died in Manila. Lee—one of only four Taiwanese students in Taipei high school class—graduated with honors and was given a scholarship to Japan's Kyoto Imperial University. During his school days, he learned kendo and bushido. A lifelong collector of books, Lee was heavily influenced by Japanese thinkers like Nitobe Inazō and Kitaro Nishida in Kyoto. In 1944 he too volunteered for service in the Imperial Japanese Army and became a second lieutenant, in command of an anti-aircraft gun in Taiwan. He was ordered back to Japan in 1945 and participated in the clean-up after the great Tokyo firebombing of March 1945. Lee stayed in Japan after the surrender and graduated from Kyoto Imperial University in 1946. After World War II ended, and the Republic of China took over Taiwan, Lee enrolled in the National Taiwan University, where in 1948 he earned a bachelor's degree in agricultural science. Lee joined the Communist Party of China (CPC) for two stints, in September 1946 and October or November 1947, both times briefly. Lee began the New Democracy Association with four others. This group was absorbed by the CPC, and Lee officially left the party in September 1948. In a 2002 interview Lee himself admitted that he had been a Communist. In that same interview Lee said that he has strongly opposed Communism for a long time because he understands the theory well and knows that it is doomed to fail. Lee stated that he joined the Communists out of hatred for the KMT. In 1953, Lee received a master's degree in agricultural economics from the Iowa State University (ISU) in the United States. Lee returned to Taiwan in 1957 as an economist with the Joint Commission on Rural Reconstruction (JCRR), an organization sponsored by the U.S. which aimed at modernizing Taiwan's agricultural system and at land reform. During this period, he also worked as an adjunct professor in the Department of Economics at National Taiwan University and taught at the Graduate School of East Asian Studies at National Chengchi University. In the mid-1960s Lee returned to the United States, and earned a PhD in agricultural economics from Cornell University in 1968. Lee's doctoral dissertation, Intersectoral Capital Flows in the Economic Development of Taiwan, 1895–1960 (published as a book under the same name) was honored as the year's best doctoral thesis by the American Association of Agricultural Economics and remains an influential work on Taiwan's economy during the Japanese and early KMT periods. Lee encountered Christianity as a young man and in 1961 was baptised. For most of the rest of his political career, despite holding high office, Lee has made a habit of giving sermons at churches around Taiwan, mostly on apolitical themes of service and humility. He is a member of the Presbyterian Church in Taiwan. Lee speaks Mandarin Chinese, Taiwanese Hokkien, English, and Japanese. It has been claimed that he was more proficient in Japanese than he is in Mandarin. Shortly after returning to Taiwan, Lee joined the KMT in 1971 and was made a cabinet minister without portfolio responsible for agriculture. In 1978 Lee was appointed Mayor of Taipei, where he solved water shortages and improved the city's irrigation problems. In 1981, he became governor of Taiwan Province and made further irrigation improvements. As a skilled technocrat, Lee soon caught the eye of President Chiang Ching-kuo as a strong candidate to serve as Vice President. Chiang sought to move more authority to the bensheng ren (residents on Taiwan before 1949 and their descendants) instead of continuing to promote waisheng ren (mainland Chinese immigrants who arrived in Taiwan after 1949 and their descendants) as his father had. President Chiang nominated Lee to become his Vice President. Lee was formally elected by the National Assembly in 1984. Chiang Ching-kuo died in January 1988 and Lee succeeded him as President. The "Palace Faction" of the KMT, a group of conservative mainlanders headed by General Hau Pei-tsun, Premier Yu Kuo-hwa, and Education Minister Lee Huan, was deeply distrustful of Lee Teng-hui and sought to block his accession to the KMT chairmanship and sideline him as a figurehead. With the help of James Soong—himself a member of the Palace Faction—who quieted the hardliners with the famous plea "Each day of delay is a day of disrespect to Ching-kuo," Lee was allowed to ascend to the chairmanship unobstructed. At the 13th National Congress of Kuomintang on July 1988, Lee named 31 members of the Central Committee, 16 of whom were bensheng ren: for the first time, bensheng ren held a majority in what was then a powerful policy-making body. As he consolidated power during the early years of his presidency, Lee allowed his rivals within the KMT to occupy positions of influence: when Yu Guo-hwa retired as premier in 1989, he was replaced by Lee Huan, who was succeeded by Hau Pei-tsun in 1990. At the same time, Lee made a major reshuffle of the Executive Yuan, as he had done with the KMT Central Committee, replacing several elderly waisheng ren with younger bensheng ren, mostly of technical backgrounds. Fourteen of these new appointees, like Lee, received PhDs in the United States. Prominent among the appointments were Lien Chan as foreign minister and Shirley Kuo as finance minister. 1990 saw the arrival of the Wild Lily student movement on behalf of full democracy for Taiwan. Thousands of Taiwanese students demonstrated for democratic reforms. The demonstrations culminated in a sit-in demonstration by over 300,000 students at Memorial Square in Taipei. Students called for direct elections of the national president and vice president and for a new election for all legislative seats. On 21 March Lee welcomed some of the students to the Presidential Building. He expressed his support of their goals and pledged his commitment to full democracy in Taiwan. The moment is regarded by supporters of democracy in Taiwan as perhaps his finest moment in office. Gatherings recalling the student movement are regularly held around Taiwan every 21 March. In May 1991 Lee spearheaded a drive to eliminate the Temporary Provisions Effective During the Period of Communist Rebellion, laws put in place following the KMT arrival in 1949 that suspended the democratic functions of the government. In December 1991, the original members of the Legislative Yuan, elected to represent mainland China constituencies in 1948, were forced to resign and new elections were held to apportion more seats to the bensheng ren. The elections forced Hau Pei-tsun from the premiership, a position he was given in exchange for his tacit support of Lee. He was replaced by Lien Chan, then an ally of Lee. The prospect of the first island-wide democratic election the next year, together with Lee's June 1995 visit to Cornell University, sparked the Third Taiwan Strait Crisis. The previous eight presidents and vice presidents of the ROC had been elected by the members of the National Assembly. For the first time the President of the ROC would be elected by majority vote of Taiwan's population. The People's Republic of China conducted a series of missile tests in the waters surrounding Taiwan and other military maneuvers off the coast of Fujian in response to what Communist Party leaders described as moves by Lee to "split the motherland." The PRC government launched another set of tests just days before the election, sending missiles over the island to express its dissatisfaction should the Taiwanese people vote for Lee. The military actions disrupted trade and shipping lines and caused a temporary dip in the Asian stock market. Ironically, the 1996 missile launches boosted support for Lee instead. Lee's overall stance on Taiwanese independence during the election cycle was characterized as "deliberately vague". On 23 March 1996, Lee became the first popularly elected ROC president with 54% of the vote. Many people who worked or resided in other countries made special trips back to the island to vote. In addition to the president, the governor of Taiwan Province and the mayors of Taipei and Kaohsiung (as leaders of provincial level divisions they were formerly appointed by the president) became popularly elected. Lee, in an interview that same year, expressed his view that a special state-to-state relationship existed between Taiwan and mainland China that all negotiations between the two sides of the Strait needed to observe. As president, he attempted to further reform the government. Controversially, he attempted to remove the provincial level of government and proposed that lower level government officials be appointed, not elected. Lee, observing constitutional term limits he had helped enact, stepped down from the presidency at the end of his term in 2000. That year Democratic Progressive Party candidate Chen Shui-bian won the national election with 39% of the vote in a three-way race. Chen's victory marked an end to KMT rule and the first peaceful transfer of power in Taiwan's new democratic system. Supporters of rival candidates Lien Chan and James Soong accused Lee of setting up the split in the KMT that had enabled Chen to win. Lee had promoted the uncharismatic Lien over the popular Soong as the KMT candidate. Soong had subsequently run as an independent and was expelled from the KMT. The number of votes garnered by both Soong and Lien would have accounted for approximately 60% of the vote while individually the candidates placed behind Chen. Protests were staged in front of the KMT party headquarters in Taipei. Fuelling this anger were the persistent suspicions following Lee throughout his presidency that he secretly supported Taiwan independence and that he was intentionally sabotaging the Kuomintang from above. Lee resigned his chairmanship on 24 March. Since leaving office Lee and the new party he went on to found, the TSU, have generally supported "green" causes in Taiwan. Lee continues to travel, make speeches, campaign for TSU candidates, and offer independent-minded commentary on Taiwan politics. "Lee Teng-Hui University" in Taiwan is named after him. KMT officials expressed dissatisfaction with efforts to "localize" the KMT and his tacit support of the new Chen administration. Lee Teng-hui, during his presidency, supported Taiwanization. The Taiwanization movement has its roots in Japanese rule founded during the Japanese era and sought to put emphasis on vernacular Taiwanese culture in Taiwan as the center of people's lives as opposed to Nationalist China. During the Chiang era, China was promoted as the center of an ideology that would build a Chinese national outlook in a people who had once considered themselves Japanese subjects. Taiwan was often relegated to a backwater province of China in the KMT-supported history books. People were discouraged from studying local Taiwanese customs, which were to be replaced by mainstream Chinese customs. Lee sought to turn Taiwan into a center rather than an appendage. This shift was widely supported in Taiwan and found expression in Taiwanese literature movement. He further stated that he believed a Chinese identity and a Taiwanese identity were ultimately incompatible, a notion controversial in the KMT, even among those members who generally supported Taiwanization. During his presidency, one of his notable efforts was changing the previously Sinicized national curriculum and school textbooks in favor of Taiwanization. After his presidency, the government continue his Taiwanization policy. Under Lee Teng-hui, it was stated that "legally, historically, geographically, or in reality", all of the South China Sea and Spratly islands were the territory of the Republic of China and under ROC sovereignty, and denounced actions undertaken there by Malaysia and the Philippines, in a statement on 13 July 1999 released by the foreign ministry of Taiwan. The claims made by both the People's Republic of China and the Republic of China "mirror" each other. During international talks involving the Spratly islands, the PRC and ROC have sometimes made efforts to coordinate their positions with each other since both have the same claims. Since resigning the chairmanship of the KMT, Lee has stated a number of political positions and ideas which he did not mention while he was President, but which he appeared to have privately maintained. After Lee endorsed the new formed Pan-Green Taiwan Solidarity Union candidates which the party was formed by part of his KMT allies, he was expelled from KMT on 21 September 2001. Lee has never intended to rejoin the KMT. After his presidency, Lee changes his political stances to endorse pan-Green candidates. Lee has publicly supported the Name Rectification Campaigns in Taiwan and proposed changing the name of the country from the Republic of China to the Republic of Taiwan. He generally opposes unlimited economic ties with mainland China, though he supports free trade. Lee has also stated that he believes that Taiwan cannot avoid being assimilated into the People's Republic of China unless it completely rejects its historical Chinese identity, and that he believes that it is essential that Taiwanese unite and develop a unified and separate identity other than the Chinese one. Furthermore, in reference to Mainlanders he believes that to be truly Taiwanese, one must assume a "New Taiwanese" identity. He dismisses both the notion that the strategy will trigger an invasion by the Chinese government and the notion that Taiwan benefits economically by developing economic ties with China. He argues the People's Republic of China is a paper tiger and both its military strength and economic strength have been far overestimated. Lee asserts that when presented with a united and assertive Taiwan, Taiwan will receive support from the international community and also from the United States and that the PRC will be obliged to back down. He also believes that the PRC economy is doomed to collapse and that unlimited integration with the PRC economy, on the part of Taiwan or any country, is unwise. During the 2004 Presidential campaign, President Chen Shui-bian publicly campaigned with Lee Teng-hui and developed a campaign platform, including a call for a new constitution adopted by referendum, which could be interpreted as an opportunity to make the symbolic changes which Lee supports. There was concern in the United States and in the People's Republic of China that Chen would be supportive of Lee's positions, a belief which was reinforced by Lee's own actions while President and by Lee's public statements that Chen Shui-bian agreed with him. The concern shared between the United States and the People's Republic of China was the possible unilateral change of the cross-strait status quo by President Chen, leading to a public rebuke of Chen from the United States President George W. Bush in December 2003. It is believed that this rebuke in part was intended to challenge the notion, which Lee had advanced, that American support of Taiwan was unconditional. After his close election in March 2004, Chen moved to distance himself from Lee, by stating explicitly that his regime's constitutional reforms would not rename "The Republic of China" to Taiwan. The difference in the two leader's positions was further highlighted by Chen's stated intent to establish greater economic links with China. In February 2007 Lee shocked the media when he revealed that he did not support Taiwanese independence, when he was widely seen as the spiritual leader of the pro-independence movement. Lee also said that he supported opening up trade and tourism with China, a position he had opposed before. Lee later explained that Taiwan already enjoys de facto independence and that political maneuvering over details of expressing it is counterproductive. He maintains that "Taiwan should seek 'normalization' by changing its name and amending its constitution." Lee enjoys a warm relationship with the people and culture of Japan. Taiwan was occupied by Japan from 1895 to 1945 and natives of the island who grew up in that period, such as Lee, attended schools where Japanese language, songs, and stories were taught. Lee's father was a middle-level Japanese police aide; his older brother died serving in the Imperial Japanese Navy in World War II and is listed in the Yasukuni Shrine in Tokyo. During his youth Lee had a Japanese name, Iwasato Masao (岩里政男). Lee speaks fondly of his upbringing and his teachers and has been welcomed in visits to Japan since leaving office. Lee's admiration and enjoyment of all things Japanese has been the target of criticism from the Pan-Blue Coalition in Taiwan, as well as from China, due to the anti-Japanese sentiment formed during and after World War II. However, this animosity has fallen in recent years, especially in Taiwan. In 1989 he received the highest distinction of the Scout Association of Japan, the Golden Pheasant Award. In August 2001, Lee said of Junichiro Koizumi's controversial visit to Yasukuni Shrine, "It is natural for a premier of a country to commemorate the souls of people who lost their lives for their country." In a May 2007 trip to Japan, Lee visited the shrine himself to pay tribute to his older brother. Controversy rose because the shrine also enshrines World War II Class A criminals among the other soldiers. During the 2012 China anti-Japanese demonstrations, on 13 September 2012, Lee remarked, "The Senkaku Islands, no matter whether in the past, for now or in the future, certainly belong to Japan." Ten years previously, he had stated, "The Senkaku Islands are the territory of Japan." In September 2014, Lee expressed support for a Japanese equivalent to the United States' Taiwan Relations Act, which was discussed in the Japanese Diet in February, though the idea was first proposed by Chen Shui-bian in 2006. In 2014, Lee said in a Japanese right-wing magazine SAPIO published by Shogakukan "China spreads lies such as Nanjing Massacre to the world ... Korea and China use invented history as their activity of propaganda for their country. Comfort women is the most remarkable example." In 2015, Lee said "The issue of Taiwanese comfort women is already solved" in the Japanese magazine Voice (published by PHP Institute), and was strongly criticized by Chen Yi-xin, spokesman of the Presidential Office as "not ignorant but cold-blooded". Chen added, "If Lee Teng-hui really thinks the issue of comfort women is solved, go to a theater and see Song of the Reed." In July 2015, Lee visited Japan, and again stated that Japan has full sovereignty over the Senkaku Islands. This was the first time Lee made remarks of this nature while in Japan. Members of both the New Party and Kuomintang accused him of treason. New Party leader Yok Mu-ming filed charges of treason against Lee, while the KMT's Lai Shyh-bao called a caucus meeting to seek revisions to the Act Governing Preferential Treatment for Retired Presidents and Vice Presidents, aimed at denying Lee privileges as a former president. Lee has also stated that Taiwanese people were "subjects of Japan" and that Taiwan and Japan were "one country", sparking much criticism from both mainland China and the Pan-Blue Coalition. Lee published a book, Remaining Life: My Life Journey and the Road of Taiwan's Democracy, in February 2016. In it, he reasserted support for Japanese sovereignty claims over the Senkaku Islands, drawing complaints from the ROC Presidential Office, President-elect Tsai Ing-wen, and Yilan County fishermen. On June 22, 2018, he visited Japan again. On 30 June 2011, Lee, along with former KMT financier Liu Tai-ying were indicted on graft and money-laundering charges and accused of embezzling US$7.79 million in public funds. He was acquitted by the Taipei District Court on 15 November 2013. Prosecutors appealed the ruling, but on 20 August 2014, Lee was cleared of the charges again. Lee was a Presbyterian Christian. Lee married Tseng Wen-hui on 9 February 1949, with whom he had three children. Their firstborn son Lee Hsien-wen (c. 1950 – March 21, 1982) died of sinus cancer. Daughters Anna and Annie, were born c. 1952 and c. 1954, respectively. Shortly after stepping down from the presidency in 2000, Lee had coronary artery bypass surgery. In late 2011, Lee underwent surgery to remove stage II colon adenocarcinoma, the most common form of colon cancer. Two years later, he had a stent implanted in his vertebral artery following an occlusion. Lee was sent to Taipei Veterans General Hospital in November 2015 after experiencing numbness in his right hand, and later diagnosed with a minor stroke. On 29 November 2018, he was rushed to Taipei Veterans General Hospital after falling and hitting his head. He discharged from hospital on 31 January 2019, later President Tsai Ing-wen visited him at his home. ^ Chen, Melody (1 January 2004). "Japan's criticism of referendum has Lee outraged". Taipei Times. Retrieved 30 September 2014. ^ Lin, Mei-chun (28 December 2001). "Lee Teng-hui seeks KMT legislators". Taipei Times. Retrieved 30 September 2014. ^ a b "再發"參拜靖國神社"論 李登輝媚日情結大起底 2010-11-03". People's Daily. 兩岸網. 3 November 2010. Archived from the original on 2 January 2013. Retrieved 1 October 2012. ^ "再發"參拜靖國神社"論 李登輝媚日情結大起底 2010-11-03". People's Daily. 兩岸網. 3 November 2010. Archived from the original on 2 January 2013. Retrieved 1 October 2012. ^ Jacobs, J. Bruce; Liu, I-hao Ben (June 2007). "Lee Teng-Hui and the Idea of "Taiwan"". The China Quarterly (190): 375–393. JSTOR 20192775. ^ Hickey, Dennis V. (2006). Foreign Policy Making in Taiwan. Routledge. p. 88. ISBN 9781134003051. ^ Wang, Chris (20 June 2013). "Lee Teng-hui says he never applied for membership in CCP". Taipei Times. Retrieved 26 October 2014. ^ Kuo, Adam Tyrsett (30 July 2014). "Ex-president denies ever being member of communist party". The China Post. Retrieved 26 October 2014. ^ "Lee Teng-hui responds to Communist Party rumors". Want Want China Times. 21 June 2013. Archived from the original on 26 October 2014. Retrieved 26 October 2014. ^ Tsai, Shih-shan Henry (2005). Lee Teng-Hui and Taiwan's Quest for Identity. Palgrave Macmillan. p. 60. ISBN 9781403977175. ^ Lin, Mei-Chun (8 November 2002). "Lee admits to fling with Communism". Taipei Times. Retrieved 26 October 2014. ^ a b Haberman, Clyde (15 January 1988). "MAN IN THE NEWS: Lee Teng-hui; Taiwan's Leader and Son of the Soil". The New York Times. The New York Times Company. Retrieved 18 November 2018. ^ Tsai, Shih-shan Henry (2005). Lee Teng-Hui and Taiwan's Quest for Identity. Palgrave Macmillan. pp. 85–86. ISBN 9781403977175. ^ "Lee Teng-hui: From scholar to statesman". Taiwan Today. 16 June 1995. Archived from the original on 4 November 2014. Retrieved 3 November 2014. ^ Wilde, Parke (May 1997). "TRANSFORMING AGRICULTURE AND THE NATIONAL ECONOMY IN TAIWAN: LEE TENG-HUI AND THE JOINT COMMISSION ON RURAL RECONSTRUCTION (JCRR)" (PDF). Cornell University Press. Retrieved 4 November 2014. ^ Tsai, Shih-shan Henry (2005). Lee Teng-Hui and Taiwan's Quest for Identity. Palgrave Macmillan. p. 93. ISBN 9781403977175. ^ a b Kagan, Richard C. (2007). Taiwan's Statesman: Lee Teng-Hui and Democracy in Asia. Naval Institute Press. ISBN 9781591144274. ^ 曹, 長青 (1 September 2004). 李登輝的基督信仰 (in Chinese). Epoch Times. Retrieved 26 October 2014. ^ Kuo, Cheng-Tian (2008). Religion and Democracy in Taiwan. Albany, New York: State University of New York Press. p. 13. ISBN 978-0-7914-7445-7. Li Deng-hui was a devoted Presbyterian, but he did not forget his duty as the national leader to pay regular visits to holy places of various religions. ^ Tsai, Henry Shih-shan (2005). Lee Teng-Hui and Taiwan's Quest for Identity. Palgrave Macmillan. p. 96. ISBN 9781403977175. ^ Crowell, Todd and Laurie Underwood. "In the Eye of the Storm." (Archive) Asiaweek. "The mainland leadership regards him as a closet secessionist and possibly too pro-Japanese (born during Japan's occupation of Taiwan, he speaks Japanese better than Mandarin)." ^ Han Cheung (2 September 2018). "Taiwan in Time: The former president's reversal". Taipei Times. Retrieved 1 September 2018. ^ "The Soul of a Statesman". Taiwan Today. 1 April 2008. Retrieved 31 July 2018. ^ Tsai, Shih-shan Henry (2005). Lee Teng-hui and Taiwan's Quest for Identity (PDF). Palgrave Macmilllan. p. xiv. doi:10.1057/9781403977175. ISBN 978-1-4039-7717-5. ^ Tyler, Patrick E. (22 March 1996). "Tension in Taiwan". New York Times. Retrieved 3 June 2016. ^ "Why Beijing fears Taiwan's Lee Teng-hui". CNN.com. Retrieved 4 November 2014. ^ Ajello, Robin; Eyton, Laurence (6 June 1997). "Superman no more". CNN.com. Retrieved 19 February 2017. ^ "Farewell Lee Teng-hui". Wall Street Journal. 24 March 2000. Retrieved 3 June 2016. ^ STRATFOR's Global Intelligence Update (14 July 1999). "Taiwan sticks to its guns, to U.S. chagrin". Asia Times. Retrieved 10 March 2014. ^ a b Sisci, Francesco (29 June 2010). "US toe-dipping muddies South China Sea". Asia Times. Retrieved 14 May 2014. ^ Pak 2000, p. 91. ^ "Taiwan's KMT expels former president". BBC. 21 September 2001. Retrieved 1 June 2016. ^ "Lee urges 'Taiwan' name change". China Post. 24 August 2003. Retrieved 19 February 2016. ^ Chen shouldn't fear dealing with China: Lee The China Post 31 May 2007. ^ Han Cheung (7 February 2016). "From Lee to Iwasato back to Lee". Taipei Times. Retrieved 8 February 2016. ^ Takefumi Hayata (28 May 2001). "Japanese must look beyond Lee Teng-hui". Taipei Times. Retrieved 7 September 2014. ^ Kastner, Jens (13 July 2011). "Lee charges stir Taiwan". Asia Times Online. Retrieved 7 September 2014. ^ Thim, Michal; Matsuoka, Misato (15 May 2014). "The Odd Couple: Japan & Taiwan's Unlikely Friendship". The Diplomat. Retrieved 13 July 2015. ^ Tsai, Vivian (14 August 2012). "Taiwan And Japan: Two Nations With Long History Stuck In Limbo". International Business Times. Retrieved 13 July 2015. ^ "Ex-Taiwan leader Lee backs Koizumi's visits to Yasukuni". Japan Times. ^ Lee to visit Japan's Yasukuni war shrine The China Post 31 May 2007. ^ Tiezzi, Shannon (30 July 2015). "Taiwan's Former President Causes Controversy in Japan". The Diplomat. Retrieved 31 July 2015. ^ "Lee Teng-hui: Diaoyutais have always been Japan's". Want China Times. 14 September 2012. Archived from the original on 6 July 2015. Retrieved 31 July 2015. ^ "Press Conference 27 September 2002". Ministry of Foreign Affairs of Japan. 24 August 2012. Retrieved 4 October 2012. ^ "Mainland refutes Japanese version of Taiwan Relations Act". Xinhua News Agency. 24 September 2014. Archived from the original on 3 April 2015. Retrieved 13 July 2015. ^ "Japanese lawmakers' version of the Taiwan Relations Act". The China Post. 27 February 2014. Retrieved 13 July 2015. ^ Tiezzi, Shannon (20 February 2014). "To Counter Beijing, Japan Moves Closer to Taiwan". The Diplomat. ^ Ko, Shu-ling (31 October 2006). "Chen urges Japanese 'Taiwan relations act'". Taipei Times. Retrieved 13 July 2015. ^ Hou, Elaine (24 July 2015). "Lee's remarks on Diaoyutais 'unacceptable': presidential spokesman". Central News Agency. Retrieved 27 July 2015. ^ Wang, H.K. ; Lin, Lillian (25 July 2015). "KMT chairman reaffirms Taiwan's sovereignty over Diaoyutais". Central News Agency. Retrieved 27 July 2015. ^ Shih Hsiu-chuan (28 July 2015). "New Party files charges against Lee". Taipei Times. Retrieved 28 July 2015. ^ Tai, Ya-chen; Liu, Shi-yi; Tung, Ning; Chao, Ken (27 July 2015). "KMT lawmakers threaten reprisal over Lee's Diayoutai comment". Central News Agency. Retrieved 27 July 2015. ^ Lu, Hsin-hui; Chang, S. C. (16 February 2016). "Former president calls for changing ROC into new republic". Central News Agency. Retrieved 16 February 2016. ^ Chen, Yu-fu; Chung, Jake (17 February 2016). "Lee Teng-hui book redefines 'status quo'". Taipei Times. Retrieved 17 February 2016. ^ Hsieh, Chia-chen; Kao, Evelyn (17 February 2016). "Presidential Office reaffirms ROC sovereignty over Diaoyutais". Central News Agency. Retrieved 18 February 2016. ^ Hsu, Stacy (18 February 2016). "Presidential Office blasts Lee over Diaoyutais claim". Taipei Times. Retrieved 18 February 2016. ^ Yeh, Sophia; Chen, Christie (17 February 2016). "Tsai refutes ex-president's controversial remarks on Diaoyutais". Central News Agency. Retrieved 18 February 2016. ^ Wang, Chao-yu; Wang, Cheng-chung; Kao, Evelyn (17 February 2016). "Ex-president's Diaoyutis remarks draw ire of fishermen". Central News Agency. Retrieved 18 February 2016. ^ Ex-President Lee Teng-hui indicted China Post 1 July 2011. ^ Chao, Vincent Y. (1 July 2011). "Indictment against Lee shocks pan-green camp". Taipei Times. Retrieved 7 September 2014. ^ Chang, Rich (16 November 2013). "Court rules in favor of Lee Teng-hui in embezzlement case". Taipei Times. ^ 鄧桂芬 (10 July 2014). "國安密帳案 下月20日宣判 (Ruling on 20th of Next Month in National Security Secret Account Case)". Archived from the original on 10 August 2014. ^ Yang, Kuo Wen; Chen, Hui-ping; Pan, Jason (21 August 2014). "Lee cleared of embezzlement, again". Taipei Times. Retrieved 21 August 2014. ^ Liu, Shih-yi; Yeh, Sophia; Hsu, Elizabeth (20 August 2014). "Ex-president Lee found not guilty of corruption in retrial". Central News Agency. Retrieved 20 August 2014. ^ "Former president in Japan to visit energy facilities". Taipei Times. 20 September 2014. Retrieved 15 December 2015. ^ a b Tsai, Shih-shan Henry (2005). Lee Teng-Hui and Taiwan's Quest for Identity. Palgrave Macmillan. p. 100. ISBN 9781403977175. ^ Tsai, Shih-shan Henry (2005). Lee Teng-Hui and Taiwan's Quest for Identity. Palgrave Macmillan. p. 126. ISBN 9781403977175. ^ Lee, Hsin-fang; Chin, Jonathan (16 December 2015). "Lee Teng-hui walks his granddaughter down aisle". Taipei Times. Retrieved 16 December 2015. ^ Lin, Mei-chun (12 March 2002). "Ex-president Lee hospitalized with pneumonia and shoulder tendinitus". Taipei Times. Retrieved 6 May 2016. ^ "Lee Teng-hui 'recovering well': hospital". Taipei Times. 13 October 2013. Retrieved 19 October 2013. ^ Hsu, Stacy (30 November 2015). "Lee Teng-hui to stay in hospital following stroke". Taipei Times. Retrieved 30 November 2015. ^ Lu, Hsin-hui; Hsu, Elizabeth (29 November 2015). "Ex-President Lee Teng-hui suffers minor stroke". Central News Agency. Retrieved 30 November 2015. Lee, T.H. (1971). Intersectoral Capital Flows in the Economic Development of Taiwan: 1895-1960. Cornell University Press. ISBN 9780801406508. Falick, Michael (12 April 2004). "America and Taiwan, 1943-2004". Dickson, Bruce J.; Chao, Linda. Assessing the Lee Teng-hui Legacy. M.E. Sharpe. ISBN 9780765639912. Wikimedia Commons has media related to Lee Teng-hui.